As a REALTOR®, imagine for a moment the experience of a potential buyer shopping for a home online. In nearly every market, there are dozens of sites offering listings and local information; what would make a particular real estate website stand out to you, and what useful features would it offer? Obviously, you’d want a site that looks sharp and loads quickly on any device, provides the most up to date listing information, offers new listing email notifications to keep you informed, helpful neighborhood information, current market reports and is intuitively designed with ease of use in mind. We feel our WordPress real estate websites deliver on all counts, and our recent redesign of our classic Seattle theme is no exception. 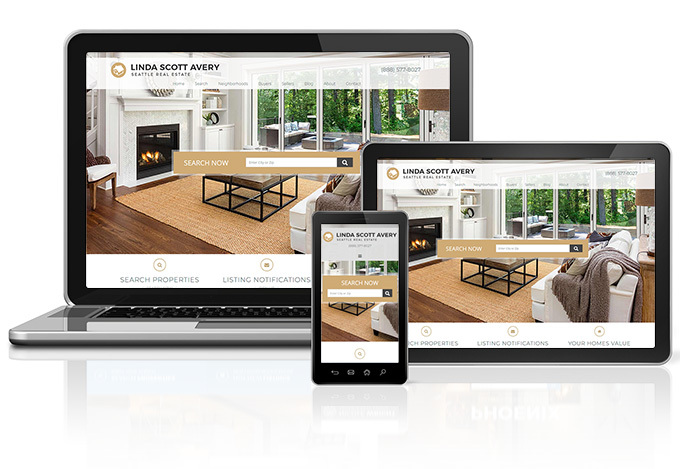 Clean, modern and fully mobile responsive our new Seattle WordPress real estate theme will make out against the competition. Several years ago, we designed our original Seattle WordPress theme with a number of considerations in mind: flexibility, mobile responsivity, and a smart-looking and polished design. It was an immediate hit with new and existing clients looking to upgrade, and over the years its understated elegance and ease of customization have made it a consistent favorite among large brokerages and enterprising agents alike. Since then, we’ve been hard at work developing a variety of WordPress real estate websites to suit a broad range of enhanced features and brand identities. However, there’s a definite timeless appeal to the less-is-more approach of our Seattle theme, which deftly makes use of white space to effortlessly guide potential clients’ eyes to call-to-action buttons and important site content. To this end, we’ve revamped our Seattle theme with a few modifications to add a few touches of modern visual flair, while keeping its streamlined simplicity intact. When making a first impression, you want your site to shine on any platform your client base happens to be using at the time, whether they’re viewing it on a desktop computer, laptop, tablet or phone. All of our sites are designed with a rigorous attention to detail to ensure that all of your site’s content and features function as well as they look, regardless of screen size. Our Seattle theme is bundled with a wide range of useful features to help you easily maintain the day-to-day operations of your site, enhance user experience, and gain visibility online. Responsive IDX integration allows your site to display MLS listings and gives your site visitors the ability to search for properties–and gives you the means you need to attract, convert and manage new leads. Our real estate add-ons (a $900 value) provide you with powerful and easy-to-use tools to stylishly showcase all of your listings, local neighborhoods, client testimonials and the members of your team. So you don’t have to, we cover the licensing cost (and renewal fees) of a host of essential WordPress plugins, such as Gravity Forms, MapPress Premium, Revolution Slider and many more. Learn more about what Premium Plugins are included with our websites. If you’re new to owning your own real estate website, or just don’t consider yourself particularly tech-savvy, don’t fret! We provide free training with our sites to ensure that you feel comfortable managing your site’s content. And if you’d prefer to leave the maintenance and more ambitious customizations to the professionals, we’re happy to offer our services in this regard as well. It’s our firm belief that successful clients are satisfied clients–and we’d love the opportunity to help you get there. How To Get the Site You Love! Start attracting and cultivating new leads on a site you own and LOVE! Give us a call or send us an email and our sales representative will be in touch with the answers to your questions about the Seattle WordPress theme, our IDX sales and all of our great website options. Whether you know exactly what you want or need to spend some time researching and reviewing your goals, our team is eager to help! We can make recommendations and answer your questions whenever you’re ready.